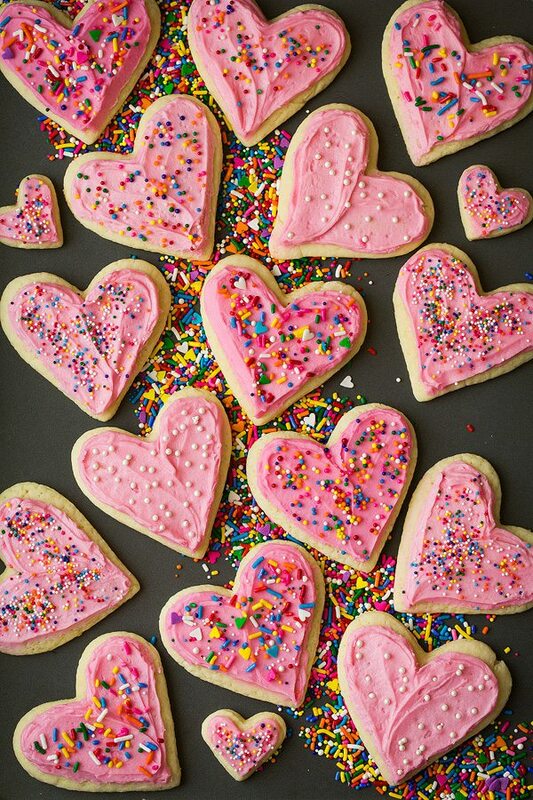 Soft Sugar Cookies are one of my all time favorite treats! They have a delicious melt-in-your-mouth texture and a sweet satisfying flavor. They’re always one of the first things to go at parties and I’m yet to meet someone who doesn’t love them! 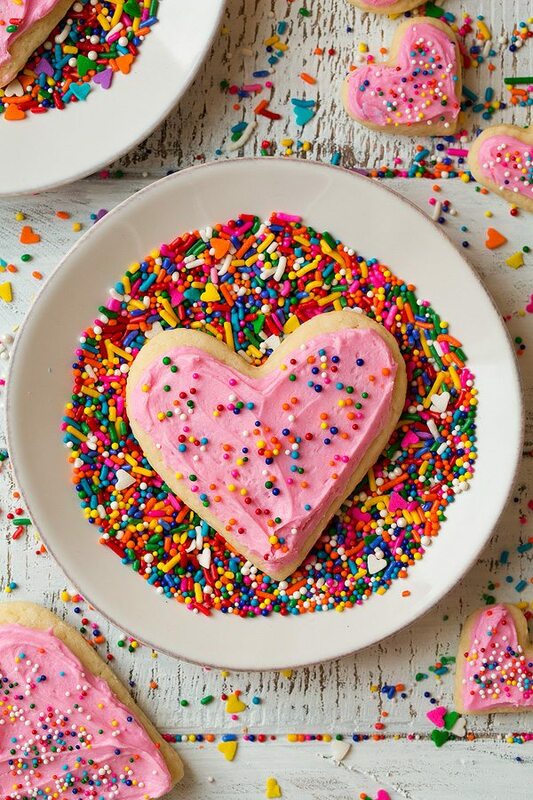 I made four batches this week trying to perfect these Soft Sour Cream Sugar Cookies and we quickly had to give most of them away because they are just 100% irresistible! Plus these are fun to make and decorate. The kids love to help too! I know I can’t believe it, I’ve been making those other ones for nearly 5 years! I just love the bit of flavor and moisture the sour cream adds to these cookies. 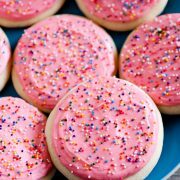 These are like a Lofthouse soft sugar cookie, but without that nasty artificial flavor and aftertaste. They have that same fluffy tender texture. They’ll most definitely will leave you craving another, and another… and another. Ask anyone in my family. 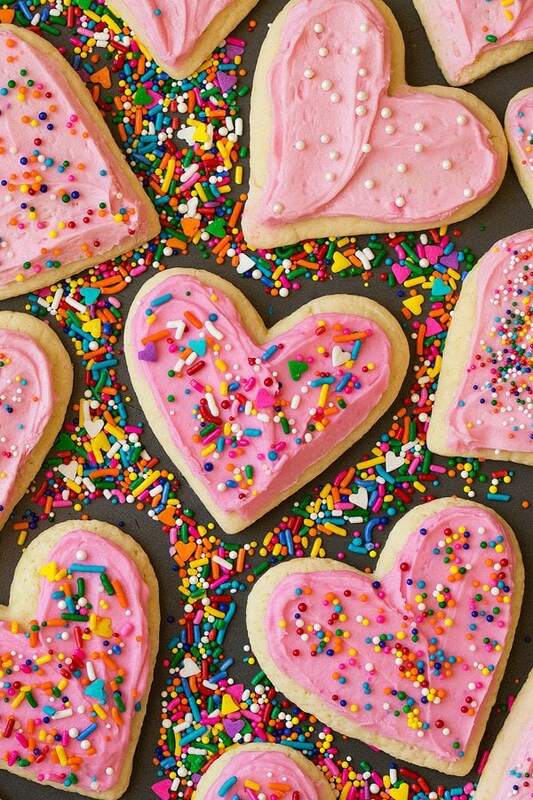 The other reason I wanted to make these cookies is because making sugar cookies around Valentines is a must for me. 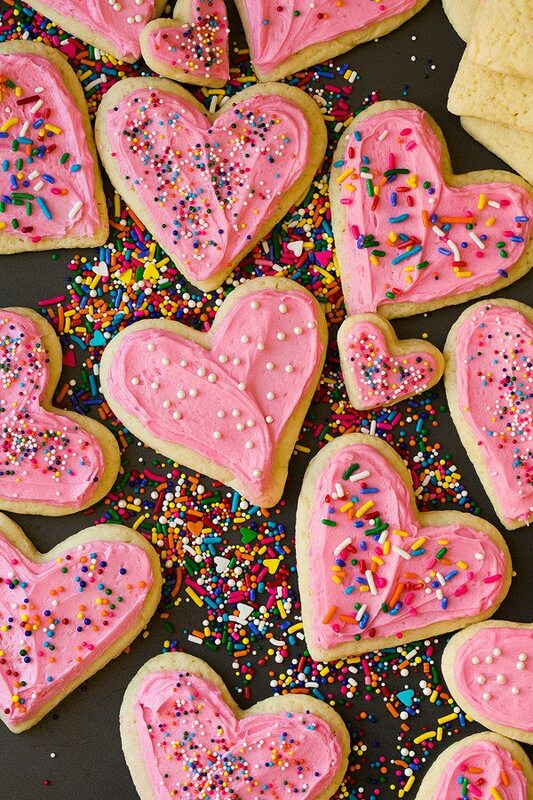 It’s basically a tradition, ever since I was little I always remember someone in my family (or myself) making soft, heart shape, frosted sugar cookies around Valentines Day so I just like to continue that. 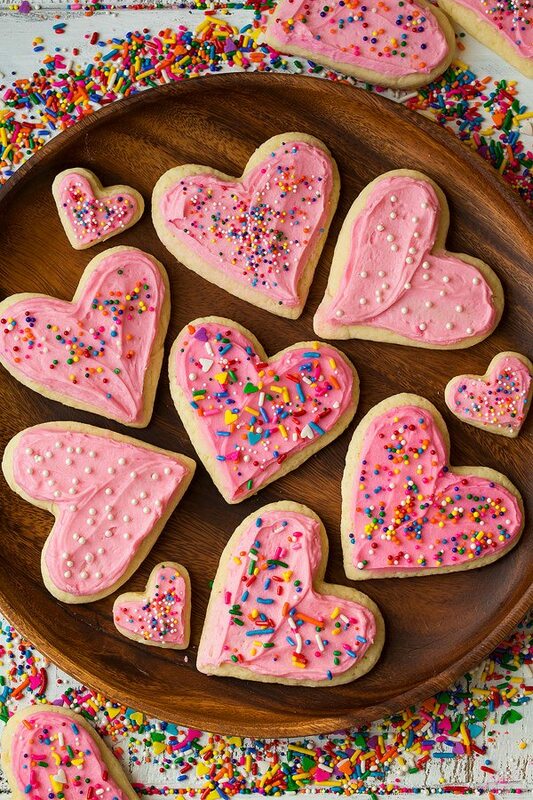 They’d be the perfect gift to make for a friend or loved one on Valentines day, forget cards and flowers just give someone a plateful of these and they’ll love you forever and ever :). Really these cookies are perfect for any of the 365 days of the year, you don’t need a reason to make these sweet, melt-in-your mouth, bites of bliss! 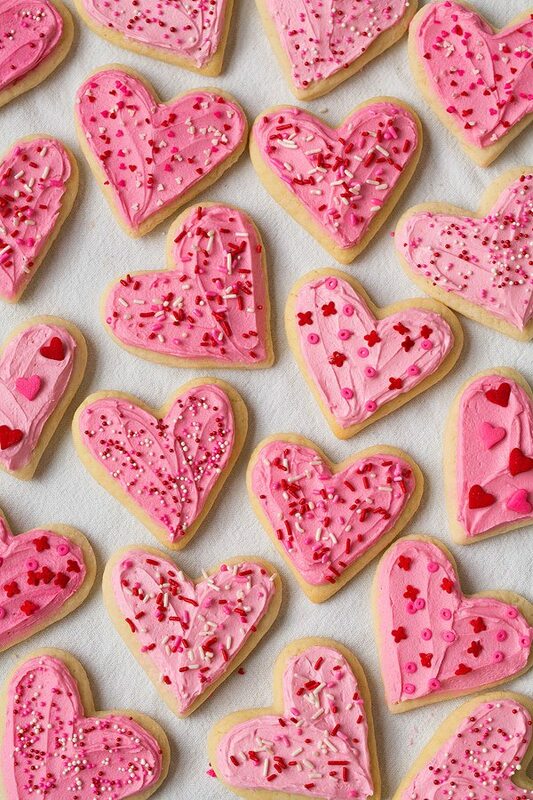 We all just need a good treat sometimes so there’s not need to wait until Valentines day. But if you want a reason just call it a test batch. In a large mixing bowl whisk together flour, cornstarch, baking powder baking soda and salt for 20 seconds, set aside. In the bowl of an electric stand mixer fitted with the paddle attachment cream together butter and sugar until blended. Mix in egg then blend in sour cream, vanilla extract and almond extract. With mixer set on low speed slowly add in flour mixture and mix until combined. Divide dough into 2 fairly equal portions. Place each portion on a sheet of plastic wrap and shape each into a round disk about 6-inches. Wrap with plastic wrap and chill 1 1/2 - 2 hours until fairly firm for rolling. Preheat oven to 350 degrees during last 20 minutes of chilling. Dust a work surface with a fair amount of flour. Remove one portion of dough from refrigerator, remove from plastic wrap and transfer to floured surface. Dust top with flour, then using a rolling pin, roll out to a 1/4-inch thickness. 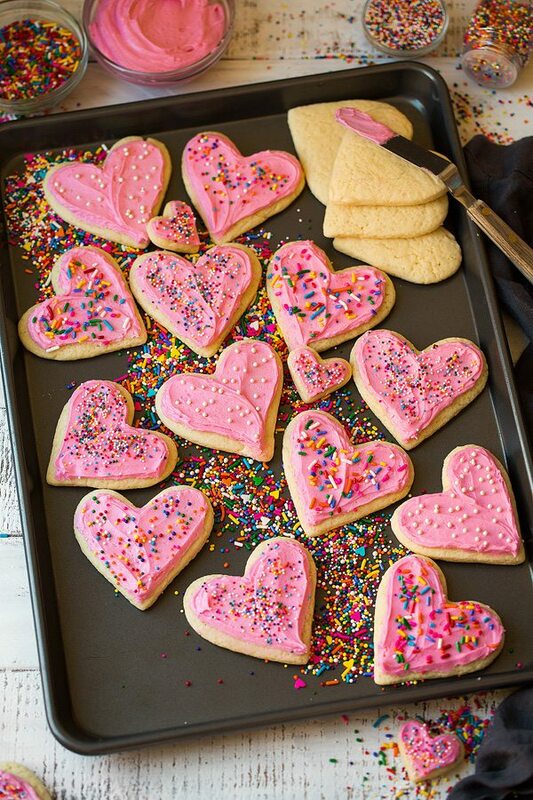 Cut into rounds or hearts (note that this dough does puff up so I don't recommend using detailed cookie cutters). Transfer to an 18 by 13-inch baking sheet lined with parchment paper or a silicone baking mat. Gather scraps and press together then re-roll dough and cut into shapes. Bake in preheated oven for 9 - 11 minutes until cookies are nearly set (you don't really want to under-bake these or they just taste doughy). Let cool several minutes on baking sheet then transfer to a wire rack to cool (after about 5 minutes of cooling on a wire rack I transfer to an airtight container to finish cooling to seal in moisture). Repeat process with remaining dough in refrigerator. 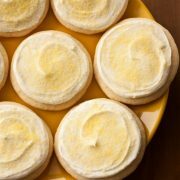 Once cookies are cool frost with the vanilla frosting and store in an airtight container. For the frosting: In the bowl of an electric stand mixer (or in a mixing bowl using an electric hand mixer) blend together butter, powdered sugar, half and half and vanilla until well combined and fluffy. Add in a little more half and half as needed 1 tsp at a time to thin. Keep covered until ready to use. *To measure flour scoop flour with a measuring cup and sweep top using a butter knife. If you are in high humidity you may need to fold in a couple more tablespoons of flour at the end if the dough is super sticky. 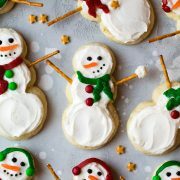 Jen: Can I freeze these cookies for later use (about a month later) – and should I do so with, or without the frosting? Jaclyn: I would probably frost after freezing.